Last night the Israeli Occupation Forces began the grotesquely named “Operation Summer Rain” on the Gaza Strip. Rafah, scene of the May 2004 Rafah massacre by Israel, was re-occupied by Israeli tanks. Gaza City was bombed by Apache helicopters and F16 and V58 fighter planes. The main electricity grid for Gaza City was bombed as was the water reticulation plant. Almost 750,000 of Gaza’s residents have no water or electricity today. Three main bridges which connect different parts of the Strip have been destroyed, slicing the Strip into two parts, and separating its people from each other, their places of work, schools, colleges and universities. In addition, the Israeli military used powerful sonic bombs throughout the night and during the day. These bombs damage eardrums, create extreme feelings of fear and anxiety and prevent the whole Gaza Strip population from sleeping at night. They also induce feelings of terror in children and babies, who are already exhibiting anxious and clinging behavior. These air-strikes and sonic bombs which damage essential infrastructure and terrify the civilian population are a form of collective punishment against the Palestinian people and are war crimes which are forbidden under international humanitarian law, especially the Fourth Geneva Convention, which prescribes the manner in which armies must treat civilians during times of conflict. We call on the international community to exert pressure on the Israeli Occupation Forces to conduct itself within the boundaries of international humanitarian law and ensure the protection of all Palestinian civilians. Doing nothing will only allow Israel to get away with continued and escalated crimes against the Palestinian people. We trust that you will not be silent in the face of such oppression. – MEDIA: Please contact your local media and request that they do not act as a mouthpiece for Israel by asserting that the aim of the Gaza invasion is to rescue the captured (not “kidnapped”) soldier. At the very least, they can say that this is what Israel claims, or they can use the word “allegedly.” It should also be made clear that the primary victim of this assault is the civilian population, and that this constitutes collective punishment of a captive population, which is a direct (and repeated) violation of the Geneva Convention. – LOBBYING: Please contact your elected representatives and ask them whether they support Israel’s barbaric crimes against innocent Palestinian civilians. If they are in support of such atrocities, well, then they’re not different than the Nazis. If they oppose these atrocities, ask them what they’re doing about it. Make your voice heard. – PROTEST: Protests are needed at Israeli embassies and consulates throughout the world. Even a one-person protest with a simple sign such as “Stop Israeli Terrorism” is good at bringing attention to the situation and letting Israel know that there is widespread opposition to its continued and escalating crimes against the Palestinian people. Believe it or not, Israel does care about its image, and if the government receives reports of a number of protests, they will feel pressured to limit the operation. Please take action on this TODAY – for the sake of the innocent civilians in Gaza. Palestinians active in non-violent struggle against the illegal Israeli annexation barrier were taken from their homes in the West Bank last night. This happens at a time when media attention is focusing on the taking of one Israeli soldier by Palestinians, and the mass-taking of 64 elected Palestinian representatives last night. Israel took two Palestinians from Bil’in and 1 from Beit Ummar – villages active in the struggle against the annexation barrier. The Israeli military took 28 year-old Yousef Abu-Marya from Beit Ummar, Hebron region.. He has been active in non-violent resistance in that region in the past two years and is a member of the Popular Committee Against the Wall and Settlements in Beit Ummar. The Committee has recently been organising non-violent actions in the area that try to gain access for Palestinian farmers to their farm land after it has been is closed off by settler violence, or closure by the Israeli military. In Bil’in, father of three, 29-year old Ahmad Katib (the brother of Mohammed Katib, one of the organisers of the weekly non-violent demonstrations against the apartheid barrier in the village) was taken by the army. Abdullah Abu-Rahme, from the Popular Committee Against the Wall and Settlements in Bil’in said that another villager, Ayad Burnat, was being held hostage in order to pressure the family into “giving up” his brother Mujahid who they want to get hold of for reasons that were unclear. Musa Abu-Marya, a member of the Popular Committee in Beit Ummar does not believe that they arrested Yousef for security reasons, but to continue a policy of threatening and arresting Palestinian peace activists. “They don’t like what we are doing in the Hebron region,” he said. Arresting activists or threatening them with arrest or violence is not a new Israeli policy. 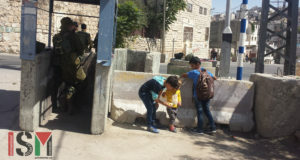 It has often been used as a scare tactic against Palestinians active in non-violent struggle against the various forms of Israeli occupation in their daily lives. Two Human Rights Workers (HRWs) received a phone call around 8:45pm, asking them to proceed to the Abu Haikal house because there were settlers from the Tel Rumeida Settlement causing problems on the family’s land. The HRWs went to the land directly, arriving 5 minutes or so after the phone call. It is 7 a.m, June 28, 2006. This is an update in the morning from last night. It was very dangerous for me to reach the computer. The power was cut off. I stayed on the floor with my son and daughter. We didn’t sleep at all like all the residents in Gaza Strip. While trying to get some hours of sleep, we did not manage. The jet fighters sonic bombs started showering us. It is very loud and horrifying noise, they are continuing their attacks. I contacted the hospital several times: no casualties yet. The operation is going on in different parts of the Gaza Strip, but it is focused in the south: Rafah. I have no idea about the casualties. We are really surrounded with death and expect death all the time. The disengagement of the Israeli army last September left Gaza people facing their destiny alone, with the full control of the Israeli occupation army outside the Gaza borders. The disengagement and building of the wall in the West Bank, did not bring peace to Israelis. It is 1:30 a.m., June 28th. The operation against Gaza, is continuing. The Gaza Bridge has been destroyed. The jet fighters are still in the sky hitting many targets. The Gaza power plant was hit by at least 7 missiles. I can see a big fire from my window and hear the sirens of emergency vans. The gun boats started shelling too. I live by the beach. It is 10:30 p.m., June 27th. I am writing while the jet fighters are in the sky, with their horrible sound, bringing death and horror. I am still like everyone: waiting. I will not go to bed tonight, most of us in Gaza will not. I prepared my emergency bag, left it next to the front door. The hospitals declared high emergency status, the medical facilities resources are exhausted, and limited due to the sanctions. We experienced all sorts of Israeli aggression in the last few months and throughout the Intifada. Since Ehud Olmert took over the government 4 months ago, 85 Palestinians were killed, economical and political sanctions were imposed and people here in Gaza have nothing to lose. Maybe they have only their chains to lose; they are frustrated and do not anticipate or look forward for any hopeful horizon. I hope Israel will not go ahead with their operation into Gaza, the outcome could be horrible, the resistance movement is going ahead with their preparation too, but the balance of power is obvious to which side, any way Israel with Palestinian resistance or no resistance is attacking us all the time, but this time will be different, and in the process many civilian lives will be lost. I am listening to the local radio. It seems that the operation started in Khanyunis, the artillery started shelling, under the cover of Apache helicopters and jet fighters. I am able to write now, but I do not know what will happen next- the power might cut off soon. A few hours ago, Mohammed and Sondos (my dear kids, I pray for the safety of all the children of the world, including Israeli children) had a narrow escape during their way home; a car exploded 150 meters from my home, close to the president’s home. One person died and 4 injured, I cannot help feeling worried. I am, after all, a mother. I shall stay strong. Tomorrow I am going to the Red Crescent society office. 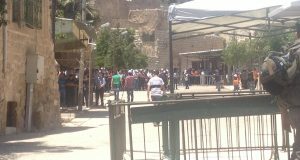 We are supposed to get some medications to be used at Alawda hospital for the emergency department that was stopped at the closed borders. I am hoping to get it through with the help of WHO. I am not sure if we shall receive them in time, but I shall keep trying. Alawda Hospital is inside Jabalia refugee camp. Two weeks ago, it received the Galia family children, who lost their parents during the beach incident. Alawda hospital medicine supplies are enough for one week of routine use. If the operation continues and the casualty numbers increase, a health disaster will follow. I am just warning, since I am a doctor. The airplane’s sound in the sky is getting louder. I shall keep writing, it is big relief for me. I decided to take a vacation to Balata refugee camp and give art lessons to children there. I hadn’t been there since the invasion in February and I recently completed a portrait of Ibrahim, a boy who died while I was there, and I wanted to give it to his family. After leaving the Issa’s house we went to the neighbor’s of Mohammad Farraj. They were a very sweet family who made us coffee and asked us how the situation in Palestine is reported on in the United States. I told them people have absolutely no idea what is going on here. It never ceases to amaze me, the warmth and friendliness of people I meet in places like this. There’s not one family in Balata that doesn’t have a horror story of their own, yet they are so kind and welcoming. Ahmad, one of the sons, about 15 years old is missing all of the teeth on the right side of his mouth where he was hit with shrapnel. His face is also mildly disfigured. The next day at about 10 a.m. we bought falafel sandwiches for 11 boys and girls, put them in two taxis, drove them out of the refugee camp to a playground in Nablus where I gave them an art lesson. I asked them to draw pictures of their daily life. The result was heartbreaking, but at the same time it was nice to be able to give these kids something fun to do, something they were so grateful for, and also to be able to play with them in the park. We all had a great time. It was a much needed break. At 4 p.m. we left Balata. I plan to continue doing art lessons with the kids here. If anyone is looking to save the world I urge you to come to Balata and start a summer camp there for the kids. They need it so much. Ahmad, the 15 year old neighbor of Mohammed Farraj, walked us to our taxi. He had a necklace around his neck with about six tiny pictures in it, sort of like a locket. I asked him about it, he said they were his friends. At 7:30 a.m. yesterday morning Abu Ayyash and his son Yousef, from Beit Ummar, were accompanied by three peace activists in order to go to their land to spray the grape vines with pesticides. Despite Israeli army and settler security forces attempts to stop them, they succeeded in working the land. On the way to the land we met another farmer, Mahmoud A’akel from Halhul who asked if we could also accompany him. Abu A’akel and one international peace activist never made it to the land and just crossed the settler road when they were stopped by the settlement security. The security guards, equipped with M-16’s, told them that they were not allowed to enter. The security then drove to the land of Abu Ayyash and tried to physically stop them from spraying the grapes. 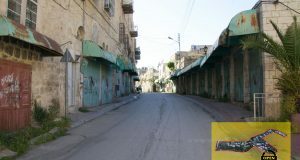 Abu Ayyash owns three dunums of land that borders the Karme Sur settlement road, which acts as a border to the settlement. The three security guards said we were not allowed to be on the land because we were too close to the settlement. When they noticed that the internationals were taking pictures they became less aggressive and retreated to call for army backup. The farmers continued to work as the Israeli army arrived. The soldiers said that they must call the DCO for permission to work on their land. They conceded that there was no official order, but said that we couldn’t be on the land. The settler security and the army worked together to agree on a plan that we could stay on the land as long as the army stayed to watch. The farmers continued to work until all their grape vines were sprayed. Abu Ayyash may not have a chance to harvest the grapes, however, because the settlement plans to put a wall around the settlement and confiscate most of his land. We pulled out the metal stakes that were marking part of the route of the wall. A soldier told us that his commander ordered them to remove us from the land because it was owned by the settlement. He said that the settlement purchased the land from Abu Ayyash to build the wall. We told him that this was a lie and he has not sold his land or received any money for his land. Abu Ayyash has contacted a lawyer to fight this illegal confiscation and plans to continue to fight for his right to work his land. The Apartheid Wall in Al Khader will isolate 95 percent of the village’s land behind the wall. A tunnel is also being constructed destroying more of the village’s land and controlling movement from villages West of the Wall to Bethlehem. The route of the Wall though Al Khadr belies Israeli ‘security’ claims and reveals its true nature which is to annex as much land as possible while fencing Palestinians into ghettos. Hisham Jamjom, an International Solidarity Movement local coordinator and a resident of East Jerusalem, talked about the effects of the Wall on the local residents of those areas: “When my children grow up and want to marry, they will not be able to build houses in Jerusalem and will thus be forced to move to the West Bank. In contrast, the settlements are allowed to build huge apartment buildings, that can house tens of families. Also, villages that fall outside what Israel defines as the Jerusalem municipality, such as Beit Furik and Biddu, are forbidden to build new houses. In order to even apply for a permit, you have to come up with thousands and thousands of dollars. All this is forcing Palestinians out of Jerusalem into the West Bank. The merchants here have no income, because they depend on both tourism and the Palestinians from surrounding villages and people from other Palestinian cities such as Hebron, Ramallah, etc. Please consider supporting the International Solidarity Movement’s work with a financial contribution. You may donate securely through our website at www.palsolidarity.org/main/donations.